We all know that emotions don’t live only in our heads. The hair on our arms tends to stand on end when we feel fear, and our stomachs flutter when we’re excited or nervous. Emotions clearly have a direct physiological effect on our bodies, and now a team of Finnish researchers has analyzed exactly how—and represented them in this visualization. In a study recently published in the Proceedings of the National Academies of Sciences, more than 700 participants were shown two blank silhouettes alongside words, movies, stories, and facial expressions. They were then asked to rate how they felt and where on their body they felt it, corresponding to the silhouettes. 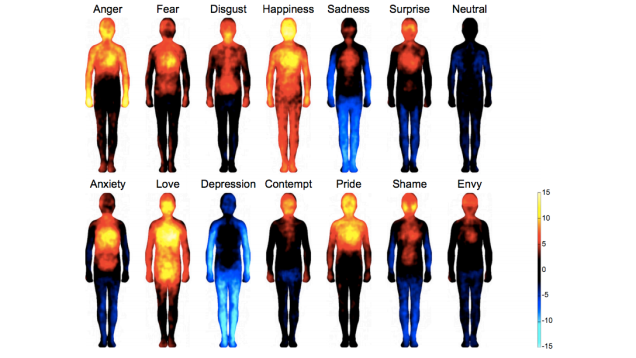 This created an overall picture of bodily responses to emotions. More activity sees the color change from black to red to yellow, while decreasing activity is represented by an increasingly bright shade of blue. The results, published in the Proceedings of the National Academies of Sciences, tally with many of the experiences you’ve probably had: depression is linked with a deadening in the limbs, while shame induces bright spots on the cheeks. Sadness even features activity in the eyes, presumably representing the tears experienced by participants. The researchers acknowledge that “[all] cultures have body-related expressions for describing emotional states” — such as “butterflies in the stomach” — that don’t necessarily have an actual physiological link, and thus, some of the feelings experienced by the participants could be societally influenced rather than organic. But, even though they can’t rule out such a possibility, the authors say the results of the study don’t agree with that argument. Researchers claim they found a strong consensus in physical responses to a given emotion in people from a range of cultural and linguistic backgrounds, (participants were drafted in from both Finland and Taiwan) suggesting that these are “universal sensation patterns triggered by activation of emotion systems” and are more likely a result of a biological basis for our response to emotions, rather than a cultural one. That might mean a blush or maybe just a nerve sensation, but it’s something we all share. More evidence that emotions are stored in the body. EFT is an effective modality that relieves the negative emotions that we accumulate throughout life that can lead to weight gain, physical pain and chronic illness. Previous PostWhen Diets Don’t Work – The Real Reason Why Some Can’t Lose Weight.